Since colonial times the position of the social, political and economic elites in Latin America has been intimately connected to their control over natural resources. Consequently, struggles to protect the environment from over-exploitation and contamination have been related to marginalized groups’ struggles against local, national and transnational elites. The recent rise of progressive, left-leaning governments – often supported by groups struggling for environmental justice – has challenged the established elites and raised expectations about new regimes for natural resource management. 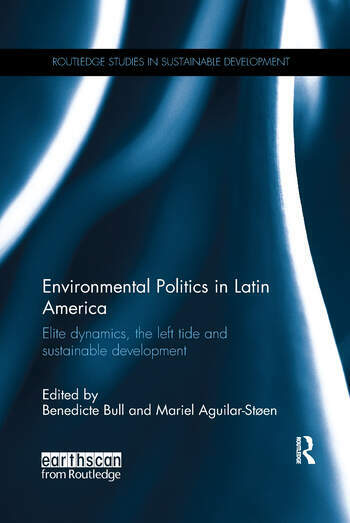 Based on case-studies in eight Latin American countries (Argentina, Brazil, Chile, Ecuador, Colombia, Bolivia, El Salvador and Guatemala), this book investigates the extent to which there have been elite shifts, how new governments have related to old elites, and how that has impacted on environmental governance and the management of natural resources. It examines the rise of new cadres of technocrats and the old economic and political elites’ struggle to remain influential. The book also discusses the challenges faced in trying to overcome structural inequalities to ensure a more sustainable and equitable governance of natural resources. This timely book will be of great interest to researchers and masters students in development studies, environmental management and governance, geography, political science and Latin American area studies. Benedicte Bull is a Professor at the Centre for Development and the Environment, University of Oslo, Norway. Mariel Aguilar-Støen is a Senior Researcher at the Centre for Development and the Environment, University of Oslo, Norway.